With a storm bearing down on us there is not much than can be done about it, but ride it out as comfortably as one can. I have a few projects waiting to be completed no time like the present, but first we dine. Make your croutons ahead of time, slice thick slices of French bread, grill or toast in a pan and rub each hot slice with cloves of garlic. Set aside and grate a nice amount of Gruyère and Emmenthal, about 3/4 of a pound for 3-4 bowls f soup. Of course you can make quick work things for my version , buy pre sliced onions (5 medium sweet) 1 – 1 1/2 cups sliced or chopped mushrooms, the remainder of the ingredients for today’s version I used what I had: 2 small bay leaves and several sprigs of thyme (both removed at serving ), a bit of salt, pepper, 3/4 cup white wine or Vermouth, 4 cups of chicken stock and one packet of concentrated vegetable stock, 2 cloves of minced garlic, 2 tablespoons of fine EVOO-Sicilian was my choice and about 2-3 tablespoons of unsalted butter. Have some extra broth on had if you need to thin your soup…2 tablespoons of flour. Jacques puts the finished soup through a food mill, I don’t stringy sweet onions are the best part, some being real chin slappers. 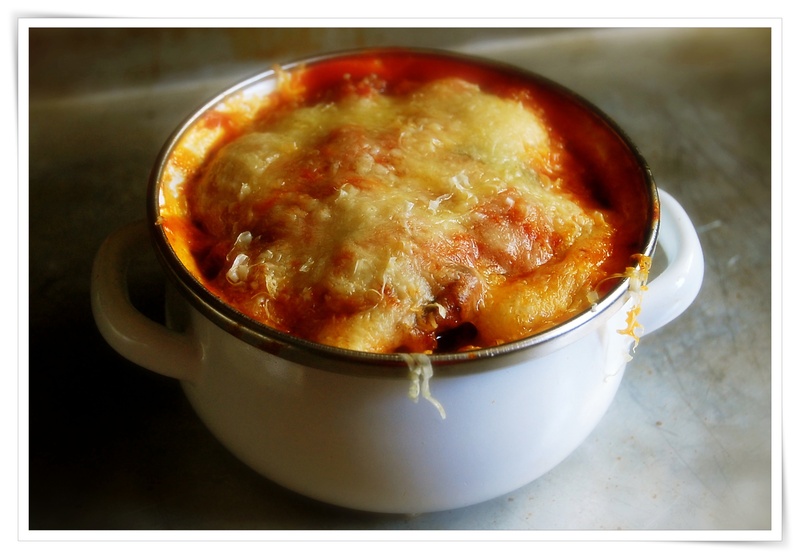 Place oven proof bowls on a sheet pan, top with crouton and pile on the cheese. “Sprinkle 1/2 cup of grated cheeses on top of the onion soup in each bowl, making sure that it not only covers the soup, but also touches the entire inside edge of each bowl, so that it will adhere to the edge as it melts during cooking. Make your croutons ahead of time, slice thick slices of French bread, grill or toast in a pan and rub each hot slice with cloves of garlic. Set aside and grate a nice amount of Gruyère and Emmenthal, about 3/4 pound for 3-4 bowls f soup.